Can it happen here? : Heroes or crazy men? 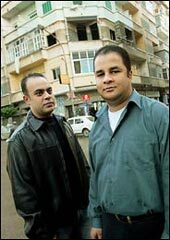 Hany and Yasser Ibrahim are two of the 1200 immigrants -- Arab, South Asian, Muslims and the simply unlucky -- swept up by U.S. authorities in the post 9/11 frenzy of fear. Like many immigrants, they had overstayed their visas. They were locked up for months in “ADMAXSHU,” the maximum security isolation jail cells. Many have reported they were brutally abused. None were ever charged with participating in any attack on the U.S. After varying lengths of time, they were simply deported to their home countries. Today the brothers returned to the United States from Egypt, kept "in the constant custody of federal marshals." They face 12 days of depositions in a class action lawsuit seeking monetary damages for their mistreatment. The Center for Constitutional Rights which represents the plaintiffs hopes the courts will recognize that the sweeps led to vicious violations of the plaintiffs' rights. The Inspector General of the Justice Department, Glen Fine ... got a tip leading him to a room way back in the Metropolitan Detention Center, and there was a stack of 400 of these videotapes just sitting there. He looked at them and found out that many of the accounts that the guards had given them of their treatment of these prisoners were demonstratively untrue. There they were on videotape being beat up. They were chained at their feet and chained with their hands behind their backs, being smashed headfirst into walls. They were being stripped naked with women around these -- I don't want to say it's proper for any prisoners, but these were Muslim and Arab prisoners who had a keen sense of the humiliation of that. This was also on videotape. So this is one more test of whether the courts will curb the lawless Bush crew. "I am not afraid," Mr. Iqbal wrote last week in an e-mail message about his return. "I am also sure that justice will be served because peoples of U.S.A. are justice-loving people regardless of race and religion." How many of us who have U.S. citizenship have this kind of faith in the underlying goodness of this country? Should we? *Times reporter Nina Bernstein wrote today's story. The photo is by Shawn Baldwin. Time to GET OVER IT! What's that hanging in the tree? Why is Cory Maye on death row? Surrounded by the "Weapons of Influence"